For the second year in a row, CBRE’s tech talent report found that Toronto is North America’s fastest growing tech market. This year, Toronto jumped up two spots from sixth to fourth on the report’s Tech Talent Scorecard, marking the first time a Canadian market has made the top five. The report found that Toronto’s employee base grew by the largest number of workers in 2017, as it added 28,900 tech jobs. This is a 13.6 percent increase from the previous year. Other Canadian cities that made the list included Ottawa and Montreal, which ranked 13th and 14th place, respectively. Ottawa, in particular, was called out for being a “top momentum market” with a strong tech employment growth trajectory in recent years. The city comprises the largest concentration of tech talent on the list at 11.2 percent, more than three times the US national average of 3.5 percent. Toronto is the third most concentrated tech market at 8.9 percent. 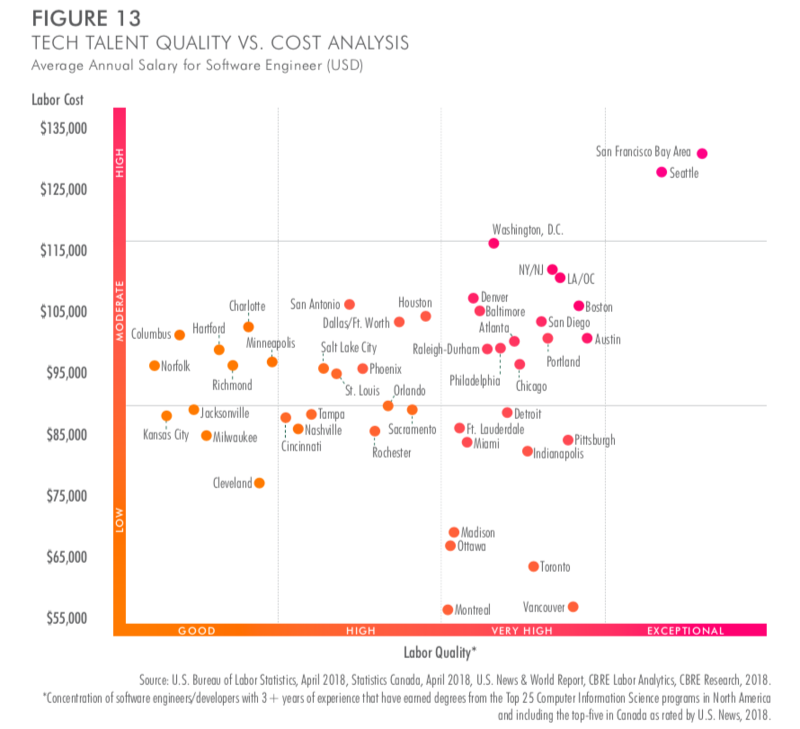 Tech talent quality vs. cost analysis (click to enlarge). The Tech Talent Scorecard is determined based on 13 unique metrics, including tech talent supply, growth, concentration, cost, completed tech degrees, industry outlook for tech job growth, and market outlook for both office and apartment rent cost growth. It evaluated 50 US and Canadian cities on these metrics. CBRE said that Canadian markets were among the best-value markets, due in part to the strong US dollar, with Toronto, Vancouver, Montreal, and Ottawa offering “high-quality talent at relatively low cost.” Taking both talent and real estate costs into consideration, the “typical” 500-person tech company requiring 75,000 square feet of office space can expect a total annual cost to range from $27.6 million USD in Montreal—the least expensive market overall—to $32.2 million USD in Ottawa, the most expensive Canadian market. The average tech salary for each of these Canadian markets ranged between 61-72 percent relative to the US average.